Time again for another snippets card for the Playground fortnightly challenge HERE and as usual the lovely Di has given us details of how she made her card to inspire us. 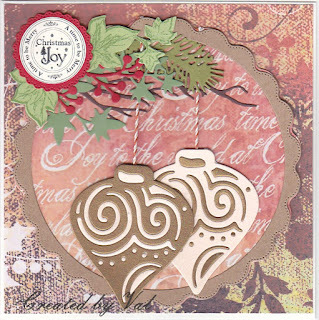 My offering this time is another Christmas card using a bauble die which was cut in gold and cream card before popping the opposite colours into the spaces to produce matching baubles in opposite colours. More snippets were used for the branches and greenery with some scraps of seasonal paper and kraft card and a sentiment. Finally a couple of pieces of twine were used to suspend the baubles from the branch. Lots of snippets used and still more waiting in the wings!! A really lovely snippet make .. .. you must have used lots and lots with this little beauty! I don't think I will ever run out of snippet!! Hope you are having a good week and thank you for your lovely comment on my blog. Yes, we feel slowly easing into retirement is a good thing so it isn't such a shock to the system. You have used your snippets to their full potential on this card! Impressive how many papers you used and it all blends so well! Love those baubles! What a fabulous card Val! Super use of all those snippets too - and a lovely colour combination as well. Love this Christmas card. Beautiful snippets festive card Val. FAB.